If you’ve started playing Uncharted 4, by now you’ve probably gotten up to that scene. The secret one. You know, the one in chapter four. 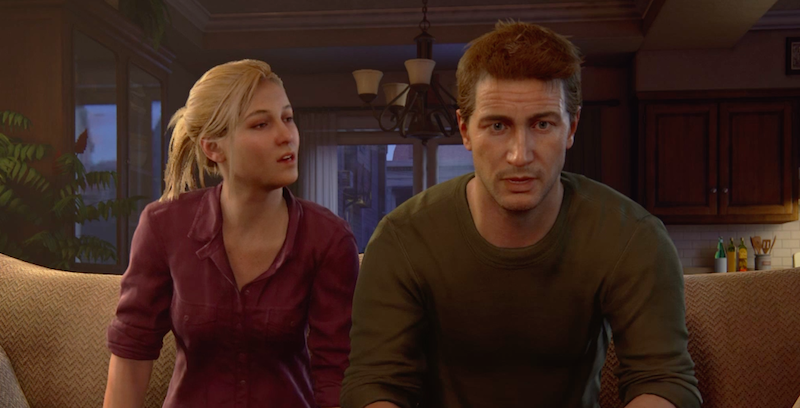 In the fourth chapter of Uncharted 4, after a hearty dinner of noodles that don’t seem to disappear no matter how many get eaten, protagonist Nathan Drake and his wife Elena decide to play some Crash Bandicoot, which means that you, the player, get to play Crash Bandicoot. Outside of the novelty of getting to play a PS1 game inside of a PS4 game—nostalgic start screen and all—there’s something really rad about this entire sequence. It’s all very human in a way that video games don’t often get to capture. The relationship between Drake and Elena feels real and true. Like any couple you’ve ever met, these video game characters slurp down noodles as they talk about their days. When one of them clearly isn’t listening, the other will call them out. They rib each other when they play video games, with the more experienced player gently encouraging the newcomer and offering direction when needed. Thanks to some smart writing and Naughty Dog’s incredible animation work, the scene has genuine heart. It makes for a sharp contrast to the rest of the game, where Drake is jumping from ledge to ledge in the most unrealistic fashion imaginable. (Raise your hand if you thought “Physics do not work like that” every time he’d leap across a chasm and grab the edge of a nearby cliff without breaking all of his fingers.) Here, in just a few minutes of tranquility, Naughty Dog has achieved something pretty damn great. And it’s all thanks to Crash Bandicoot.